When possible, I let Hila walk/run around without shoes--apparently it's better for their balance to let them practice walking on bare feet than on shoes. That's not to say that I wasn't super excited to start shoe shopping for Hila the first opportunity that I got. During her crawling phase we got her Robeez--they were used mainly to keep her feet warm and to prevent her from pulling off her socks. She wore her Robeez during her early stages of walking as well. 1. Koala Bear Robeez -- This was Hila's first pair of Robeez. Adorable, right? 2. Flower Mary Janes -- I bought these about a week before Hila started walking, so she actually hasn't gotten much wear out of them. 3. Carter's Lovely Light Up Sneakers -- These are serious sneakers. They've got a lot of padding and sort of make Hila look like Bigfoot. They light up with every adorable step she takes; I always though light up shoes were stupid, but...y'know...Hila pulls it off pretty well. 4. 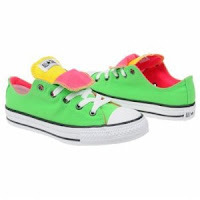 Converse All-Star Double Tongue Kid's Shoes in Green, Pink, and Yellow -- Okay, I know you're not supposed to buy ahead, but I couldn't resist. These will probably fit Hila next year. My husband says he always thought light up shoes were a sign for parents who spoil their kids, and swore his kid would never have them. Zoe has the Carters light ups too and she loves them! (true, her babi bought them but we love them too) On the functional side - our hall is very dark and the lights help her see the steps! Renee, Glad you found the blog! I also always thought light-up shoes were ridiculous. Yet when I saw these, I had to buy them. 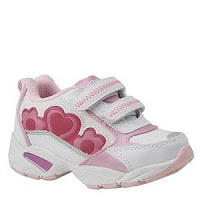 Also, i find them to be extremely sturdy and supportive for a rather inexpensive baby shoe.